New NETHERWORLD Haunted House Hoodie! 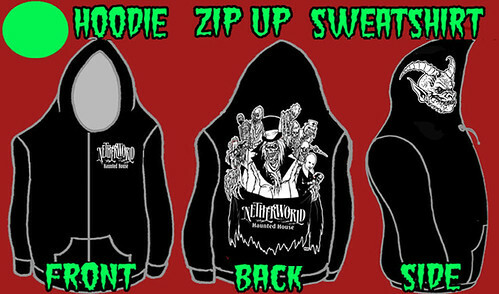 Check out this sneak peek at the new 2010 NETHERWORLD Haunted House Hoodie! Welcome to the Creepiest Place for Scary Stuff! For many, Halloween provides immeasurable opportunities to embrace a love of the macabre through fashion, collectables and memorabilia. If your love of the dark transcends the traditional, you'll find everything you need at Feargear.net , your virtual lair for Netherworld Haunted House collectables Be it cute and creepy or garishly gruesome, there is something for even the most discerning fan at Feargear! Visit the NETHERWORLD Gift Shop! NETHERWORLD Giftshop Open For Christmas Shopping!